Based in Jaipur, Suresh Gyan Vihar University has been grabbing the title of leading distance education providers since more than 5 years now. Approved by UGC-DEB and having the backend support of Rajasthan Government, SGVU has been educating professionals who have higher goals but are caught in limited schedules. Any management aspirant who plans to give SGVU a chance, then here is everything you need to know about the university and its distance education offerings as well as policies of admission. Here are some benefits of doing Distance Learning MBA degree from Suresh Gyan Vihar University. The university is UGC-DEB, AICTE and has been accredited with NAAC ‘A’ as well, which makes it an ideal fit for distance education options. The course modules are created by seasoned professionals who have decades of experience in their fields-corporate and public both. The teachings are as per the norms laid by the Distance Education Board which means all theoretical and practical aspects are part of the valid curriculum, unlike other universities who do include subjects outside the line of follow. The university believes in Research, Teaching and Extension, through which it has been able to create MBA graduates who are successfully placed in different parts of the country. Suresh Gyan Vihar University Offers total 22 specializations with their distance education MBA degree course. Here is the eligibility criteria for admission in Suresh Gyan Vihar university distance education MBA course. A candidate needs to have at least 50% in their graduation from any recognized school or college. Work experience while pursuing MBA is always recommended. Although it is not an eligibility criteria as stated by SGVU, but, faculty of the university advices students to have at least two-three years of work experience. For 10 and 10+2, candidates are required to have cleared the examinations with pass percentage. Applying in SGVU is simple; a candidate can go online and apply on the university’s website or speak to an admission counselor, in order to clear their queries. If students wish to apply offline, then they can visit the university and speak directly with the faculty in order to clear their doubts and get a good intake of the course and its possible future. Students can purchase the application prospectus, online and offline as well. They are required to fill in the exact details, as asked in the form and submit them along with the following listed documents. After the complete submission of the form and the required documents, students are sent login details by the university and the course details and material within 10-15 days. Enclose a Birth Certificate photocopy for proof-of-birth. Enclose a photocopy of marksheet of 10, 10+2 and graduation. Enclose a photocopy of a valid proof of residence like Aadhar Card/PAN card/ Passport/ Driving Licence/ Electricity or Phone Bill/ or if none of the above are present then, any Bank account statement will be required. Students who have an any GAP in education or are entitled to any dependency like backlogs and result-awaited, are required to submit an undertaking. Two colored passport sized photographs. Demand Draft of the first fee. There are two types of payments that SGVU suggests to its students. Lump Sum: Post admission confirmation, students can pay a lump sum fee of 62, 400 INR. This would eliminate the need to pay the second, third or fourth instalment. Instalments: Students can also pay fee semester wise. Per semester fee of MBA with SGVU is around 18, 000 INR. At the time of admission or the first instalment will be 20,400 INR. 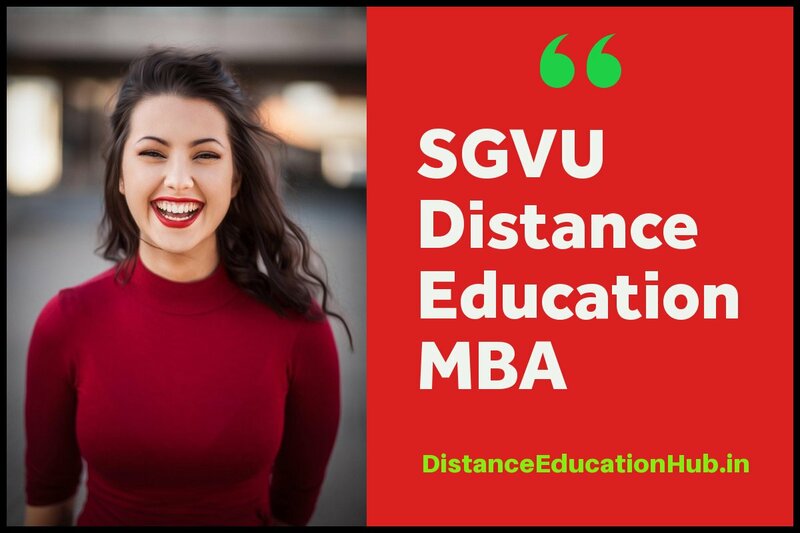 Here are some more benefits of doing a distance education MBA degree from SGVU. The university imparts its distance learning course through edusphere which is an award winning software adopted by premier universities only. The course curriculum is periodically reviewed by subject matter experts in order to update it with the current industry trends. Practical-learning oriented approach. The best benefit of having done MBA in distance education from SGVU is to have an application oriented multi-disciplinary approach towards the whole process. The course modules and assignments are designed by senior corporate winners and renowned academicians. Wide array of MBA offerings unlike other universities. Many universities in India offer a limited set of MBA specializations but SGVU offers around 22 MBA specializations. Please fill our short form and get free admission counseling from experts.